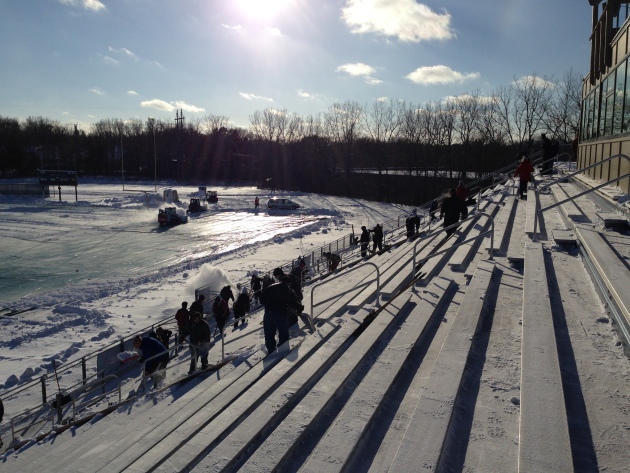 Bethel students: Shoveling out their stadium so they can freeze Saturday! Bethel University has reached the NCAA Division III football quarterfinals and will host North Central College at noon Saturday. A couple of weeks ago, when the weather wasn't so good, Bethel was able to get into the Metrodome for its first-round victory over St. Scholastica of Duluth. This Saturday, alas, the Advance Auto Parts Monster Jam quelled any thoughts of a return trip indoors. So Bethel will play at Bremer Field on a day when the predicted high temperature in seven degrees. So Bethel put out a call for students, staff and faculty to come out Thursday afternoon so things will be a bit more comfortable come Saturday. Props to those who showed up. About 60 students and 20 staff members answered the call, said Jared Johnson, Bethel's sports information director. One more wrinkle: If you're planning to go on Saturday, you're going to be asked to park off campus in a lot near the school in Arden Hills and take a shuttle bus to the field. That's because Bethel's annual (and quite good) Festival of Christmas Concert is being held at 2 p.m. Remember, it's bad, bad form to say you're going to the concert and then sneak off to the football game. And it's cheating to say you're going to the game and then watch it on the web.